After the convention that was held, we still slightly lack the final points for the ultimate discernment. But it is very close because we are already at the last degree. Yet, in order for it to become revealed, we have to go through 4 phases, as it happens on every degree, starting from its preliminary phases: 0-1-2-3. And only when we reach the last, 4th phase of this degree does it begin to come through and be felt practically, which is called “the harvest of the crops.” We did not harvest the crops yet, but we are very close to it and are already on a new degree. Therefore, I advise you to spend several days, until the end of this week, devoting all your free time to going over the Convention lessons again. This is my advice to every student, no matter where he is located in the world. Try to listen to all the lessons again 2 or 3 times, and to watch the other events at least a little, such as the friends’ assemblies, songs, dances, and everything that took place there, returning to that state again and again. Until the weekend, we will actively tune into the state of the Convention. Again and again, we have to listen to what was discussed there and maintain the same sensation that we had when we were together with the friends. Try for all of this to settle into you and to come through in the mind and feeling. You will begin to hear many things there that you did not hear before, during the lessons. And in the new vessels of perception that you received just now, you will reveal what we went through then in a new way. That’s because we have now entered the second phase. The first phase is the Inner Light, which is called “tastes” (Taamim). And the second phase is the Light’s exit from the spiritual Partzuf, “points” (Nekudot). It is precisely when leaving that place, when parting, that you build new vessels. Therefore, we have to return to the same states once we have already grown distant from them, because you are no longer in them practically. And by that you build new vessels, which are increasingly deeper. “Tastes” are what we received at the place of the Convention. And then come the following stages: “points, crowns above letters, and letters” (Nekudot-Tagin-Otiyot) during the Light’s disappearance. And it is very important to work with this disappearance of Light, having already parted with this place and action, with the sensation, but returning to it again and again. In essence, we have to return to it 4 times, but we should do it at least twice. Thus, we build our vessels (letters of work), and then we can already talk about what to do next, when we finish this action that we began at the Convention. This action has to be realized in 4 stages, when we again go through everything anew and try to assimilate it in our vessels, which have already been emptied of the initial filling and have moved slightly toward the next level. 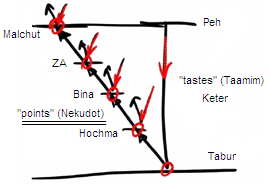 These are the phases along which a spiritual Partzuf works: the Inner Light clothes from Peh until Tabur, which is called “tastes” (Taamim), phase Keter. Then the Light comes out along 4 degrees: Hochma-Bina-Zeir Anpin-Malchut, along “points” (Nekudot). “Points” are the most important aspect because it is the beginning of new vessels. And every time the Light disappears, we have to go through the same striking adhesion with the Light (Zivug). That is, precisely in these points, we have to return to the same Light that was there in the beginning and merge with it. This is what will happen when we come back to the same material, the same actions and gatherings, as much as possible. But the most important thing is to come back to the lessons. Question: After the Arava Convention, we are returning to our groups. What would you suggest in order to strengthen the connection we attained even further? Answer: We need to carefully consider what took place at the convention, the feeling generated there. If we watch everything that happened over and over again, we might be able to feel those things once more, to relive them, in order to proceed forward with them. Most important is not to descend from that level, to realize that the obstacles are particularly designed for us to ascend. We can’t spend our whole life being at a convention, that doesn’t do us any good. It is no coincidence that everything is arranged so that now, after the convention, we can include in the degree that we attained all the rest of the masses who couldn’t participate in it, who couldn’t be inspired themselves. 1. I try to constantly remain in the perception of reality that other than the group, nothing exists. There is a system, I observe it, and through it I view the world. This system is the group, and everything taking place in this world is only the result of the quality of connection among us. Hence, I want to try to constantly remain in this perception. That’s because it’s true, it’s correct. The more we try to feel it, we will see that truly, that is how the world is governed. 2. I can maintain that to the extent I ensure that everyone is a part of it, all the friends. Here, there should be mutual concern. If I am concerned for them, I receive the concern from them, and then I don’t exit the perception of the system. That means, I should constantly maintain myself viewing the world and feeling the world through the prism of the group, accordingly regarding all my parts, all my friends, in order for that perception not to dissipate from them either: for us all to be together in such a perception of the world. If I want to maintain this form and if I am concerned for them, I receive the Arvut (Mutual Guarantee) from them. And this means that I sentence myself and the entire world to a scale of merit. That’s actually a person’s point of scrutiny and the point of choice. For now, that’s how it’s becoming clear to us. If I can’t scrutinize anything with such an approach, I shouldn’t go out to the world. We should maintain it as much as possible. Going out to the world, other than through this system, eventually causes us problems, collapse, confusion, unpleasantness, until death. All the troubles come only from our suddenly ceasing to see the single, unified system, even minimally. Parting with it is death, that is, the lack of connection between its parts plunges us into spiritual oblivion. Question: How do I look at the world through the group? Answer: Our problem is that we cannot convey our feelings to one another, and this is a matter of feeling. Just imagine: There is nothing but the desire. We study that the Creator created a desire, the four phases of the Direct Light, and then it was drawn downward and shattered. This is how “this world” was created. What is this world? It is what the desire feels in its shattered, separated, opposite parts that hate one another. It is the same desire, just shattered. The inanimate, vegetative, and animate, and human levels that we feel here in our reality are the same shattered desire that feels this way. The “corporeal matter” is the desire that has the instinctive desire in order to receive. Therefore, we should have a stabilized realistic perception of reality and not a false one. The point is not that it is imaginary or not imaginary. If I know that it is imaginary, then it is okay. The main thing is that I don’t live in the illusion of the external world. We feel the inanimate, vegetative, animate and human levels and we feel them in their shattered form. This is reality on the lowest level. Now we have to start collecting all these things in our perception and find the system that connects all of them. This is the system of the upper Providence, the goal, the process, and the trend. This is our work: to make efforts like a child, who through his efforts wants to understand the reality he is living in. This is the whole process we go through. In this “every man shall help his friend.” We should support one another. This support is sometimes felt as negative and sometimes as positive. The main thing is the perception of reality, to be aware that everything that I feel, I feel in my senses, in my desire. My desire includes the parts of the inanimate, vegetative, animate, and human and so I feel reality this way. If I begin to correct myself, to connect it all into one, I feel that reality begins to take on a more unified form. The moment I manage to connect these parts just a little, I begin to feel the power that operates them, which is called the “Creator.” If they are connected just a little, in a minimal way I already begin to feel the power that moves the system, which is Godliness, the upper force. Then I begin to see how I relate to it through all of reality and how through reality I can bring this reality to connect. Then I understand the idea of the group most clearly. On the level of the speaking are the most active parts that can share the same thoughts I have. I feel separated from them and at the same time we can work on our unity. It is as if there are other conscious parts beside myself who are aware that they should connect. We should work together against our mutual ego in order to connect. But if we connect ourselves, the parts that are distant and dispersed in my field of vision, if we begin to connect a little, everything else—the animate, vegetative and inanimate—also come along. The main thing is to connect to the group. These are parts that are also ready to be with me in the same general system, in my perception, who also share my ideas and my feelings. Of course there is a great rejecting force among us, but we understand that this rejecting force is the corruptions in the system, which we must overcome. We should use them and by them we should get closer. By that we correct the whole thickness of the system, on the levels of the inanimate, the vegetative and the animate—so that it will all be connected. This means that the negative relations among us are clearly what we should correct in order to be one, the one mechanism. Then I relate to these things with love and understanding and good will. It is like symptoms of an illness, that I should only pay attention to, and together with everyone else, with all the parts that share my thoughts, to start treating them. We should understand that there is no more than that, and nothing else will suddenly become clear. We will discover that nothing is revealed except the relations among us, and that all the rest of the world is only a result of what will happen among us. There are crises, and there is helplessness, there are great problems and all this is because we are not constantly connected to the extent that we can be connected. If we constantly keep the connection among us according to the conditions that are revealed in the system, the world will advance in a really nice form of “I shall hasten it.” If we cannot, we will be behind in the process of development, the world will suffer more and we will suffer and it will hate us and blame us for all the troubles it is feeling, and rightly so. I know that I depend on them and that I will advance if they will hold me and give me power. They will give me power, they will wake up, they will be active and ready to the extent that I worry about them. This is called tipping the scales in my favor and in favor of the whole world. If I bestow upon them, the more I bestow upon them the more they will be in this process. So immediately after having reached such a special level of connection—we should now continue seeing this system and the mutual worry for mutual connection, for mutual guarantee. Mutual guarantee is the main thing. Everyone is responsible for the whole system. It is like Baal HaSulam says, if someone falls from this, to this extent the system isn’t whole anymore and is weakened and the others cannot fulfill their role as they should. In the News (from Shanghaiist): “Chinese officials have warned that the world’s second largest economy is facing acute water shortages and that the problem is worsening on a daily basis, according to the China News Service. “Vice Minister of China’s Water Resource Ministry Hu Siyi said China’s water resources per capita stands at only 28% of the world average, during a press conference hosted by the State Council’s Information Office. “Two thirds of Chinese cities are facing water shortages and another 300 million people in rural areas have no access to safe drinking water. “Apart from water shortages, the Vice Minister listed three other challenges the country faces: poor water utility efficiency, over-development in water resources which has led to a series of ecological problems, as well as sprawling pollution. My Comment: China is coming closer to the realization of the evil of its industrial development and will be forced to curtail production and to bear the consequences. This will make it search for a new approach to its development—integral equal distribution and balance with nature. Even in such a huge society this can be achieved only by means of mandatory universal integral education. Opinion: (Mikhail Delyagin, Director of the Globalization Problems Institute): “The world has been teetering on the brink of depression for several years, and sooner or later it will fall into it. Indeed, global monopolies have developed on the global market—and naturally began to rot. It’s impossible to improve them since the market is global and there is no external competition. Demand shrinks due to their decay, and the only way to compensate for this shrinkage … is to increase the demand from the part of the state. That is, to infuse the money into the economy. And this leads to an increase in debt, which is impossible to repay. This is the situation everywhere: in the USA, EU, and China. My Comment: The world is artificially held from collapsing. But time should be devoted only to preparing humanity for the transition into a new social and economic system—a balance between us in all social structures and between the entire society and nature because balance is the fundamental law of nature, and we will be led to this state either by blows or our realization of it leading us. Question: Is the level we’ve reached in the convention the credit we should work for, or is it the result of our previous efforts? Answer: There are those who received it as a payment and there are those who received it as a down payment. Everyone has both aspects to some extent. Much of what we have received is in order to fulfill from now onward, like a down payment. We were given the opportunity to feel something in the unity, in the connection. We were given different special things from Heaven on purpose, and thanks to them we felt new phenomena in the connection among us. We should understand that this is a real gift. Now we have to process this gift internally and to fulfill it. I personally see it more as credit for the future that we should fulfill now. I don’t underestimate all our exertion, but according to the state we were in, we didn’t deserve it. We received this credit because we made efforts, but we received it not as a payment, but as a down payment, with which we should now work. From that moment and on, our task is to strengthen this perception and strive to remain in it. Through the group, the system of relationships that became very important for us, we can relate to ourselves as to its parts. Everyone no longer has anything personal: He feels as an equal member of the common system. The correction of the whole world, every part of it, depends only on the degree of inner connection in the total system. Studies and dissemination are just factors that contribute to increasing the inner connection. Thus gradually, we will understand the things, which are still distant and concealed from our perception, and discover what the entire reality means and why we should reveal it in this form: experiencing the feeling of separateness and unity. And we have to extend the feeling of this unity further, into a more interior space, into the higher dimensions: in the perception of the Creator. We have achieved a great deal at the convention, and we need to appreciate this attainment and be afraid of losing it. On the contrary, we constantly need to strengthen and reinforce this sensation so that it becomes clearer to all of us together, in some more, and in some less. In the coming days, this feeling can still grow and change depending on the extent to which we hold together in relation to the entire world and treasure the feeling of unity that we have achieved and understood in our feelings and mind and the realization that only through it we should view everything. All that happens in the world is only the external manifestation of a lack of unity or its attainment. We need to use all the opportunities given to us and use all the corrupt and corrected states so that each time we scrutinize our connection more accurately, and through it: the upper Force that is the goal of everything. We face our daily, special work with which we will advance further. Our reality is not a sequence of conventions; it consists of daily effort to relate to the entire work as a manifestation of our fragmented perception. It depends on how much we want to bring together these separate pieces of the world in order to see, feel, and perceive them as coming together into a single complete mosaic of the world. There are two feelings simultaneously getting along together inside of a desire to enjoy: above reason and inside reason. Inside reason, I develop the perception of the vessel, desires, and above reason, the perception of Light. I join the whole world to this desire and I do not separate this world from the spiritual one. I perceive everything as one whole and I relate it to matter, which is impressed by the Creator. I need to feel it with my matter, so that the whole of the still, vegetative, animate, and human levels, which I now feel, and which will yet be revealed to me in all of the upper world, all of this belongs to me, my vessel, my matter, my Malchut. While the Light—the Creator’s actions, the upper force, fulfilling, bringing to life, and controlling—remains above the perception of my vessel. However, all of this is also attained inside of me and is not left somewhere high up there in the unknown. “A judge has no more than what his eyes see.” We only talk about matter and form clothed in matter. Matter is the desire of the whole of humanity (it is not important, whether it understands it yet or not), and of all of the upper worlds as well. While the form clothed in matter is the Light filling the desire or the quality of bestowal clothed in the quality of receiving. However, both of these actions are inside of me and there is nothing else besides this: the matter and the form. Matter is the desire to enjoy, while the form, which it takes on, is the form of bestowal. I relate to the first one inside reason, while I relate to the latter one above reason. What Is That In Your Hands: A Rod Or A Serpent? Baal HaSulam, “Introduction to The Study of the Ten Sefirot,” Item 87: As long as one has not been awarded the complete, clear, and absolute attainment, love is completely beyond one’s ability, since it depends on the understanding of the heart, and no labor or coercion will help here. Obviously, what you are told and what you think is not enough. Sometimes, a person imagines that he has already attained love and infinity. It happens to everybody. How can we tell such illusions from reality? How can we check whether it is in fact a spiritual revelation? Revelation means that a person has obtained the property of bestowal. He checks himself and acknowledges his love for the created beings and his group; he sees that he attains the Creator (that is, the property of bestowal “clothed” in him) from within, due to the general interconnection between his friends. Hence, he feels that he rises above his egoism, the receiving desire, by staying in touch with it, but at the same time being outside of it. the new body: the desire to bestow that includes the power of giving, which eventually becomes his soul. He lives in it and wants to expand it. Both parts exist as one and cannot live without each other. They can be compared to dumbbells: A person feels that he is torn between its two parts, two spheres, and brings them into balance. At first, step by step, he annuls one of these two parts and enhances the other. As a result, additional power is being given to the left part; it becomes heavier and triggers an adequate enhancement of bestowal. As a result, the magnitude of both parts grows, and a person advances as if stepping in turn on each foot: The desire grows on the left side and bestowal develops on the right side. These efforts lead to revelation that occurs in the middle, thanks to the “thickness” (Aviut) and purity (Zakut) of the desire. Besides, a person understands that in order to reveal anything, he needs its lower part—his egoistic desire, resistance. He starts to value resistance since with its help he connects his Aviut with the desire to bestow and from the two layers creates a screen (Masach), on which spiritual images appear. How Can You Resist Love?